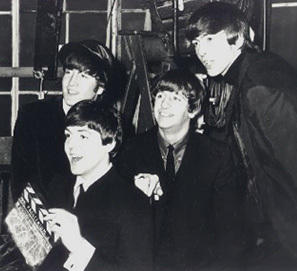 ABOUT THIS INTERVIEW: To promote the worldwide theatrical release of the movie, 'A Hard Day's Night,' the following interview was conducted with the Beatles. Copies of the recorded interview were then sent to radio stations. It was created to be an 'Open-end' interview-- meaning that once the interview was recorded, the questions were edited out so that local disc jockeys could read scripted questions along with the recording to sound as if they were personally conducting the interview. Q: "I hate to bring this up, boys, but what happened to John?" PAUL: (jokingly) "Well actually, he's gone down to the shipyards to have an estimate for a haircut." RINGO: (mock seriousness) "I don't know, he's supposed to be here. He's late, isn't he?" Q: "Well Beatles, we really are thrilled to have you here on the show today, and I want to talk to you about a great movie, 'A Hard Day's Night.' Ringo, was it really a hard day's night to make this first big one?" RINGO: "Well, it was a hard two months. It took two months actually to make this film. But, umm, I think I found the biggest drag was when we were just sitting 'round doing nothing." PAUL: "And getting up early. That was one of those things. We had to get up about six o'clock in the morning, you know, sometimes. Which is-- oh-- I'm sure it's not good for anyone, that. It's very bad for your health." Q: "George, how about you? Did you find it an easy thing to do?" GEORGE: "Oh no. In fact, you see, we're night owls, folks." GEORGE: "You mightn't have noticed. No, but-- you know, we all go out at night. And then suddenly our day was reversed, so that we had to be up at six in the morning, but we still couldn't get the hang of going to bed at night. So we were going out at night AND getting up in the morning for the first week or so, and I just couldn't believe it. Six o'clock, somebody dragging me out of bed." Q: "Ringo, at six in the morning what did you do about the bags under your eyes?" RINGO: "Umm, well, I've always had 'em. I just filled them up a bit more." Q: "How about you, Paul?" PAUL: "Well, you know. I had a bit of trouble, but there was always this handy makeup man on the (laughs) ...on the scene to sort of paint your face up a bit." Q: "Who combed your hair so early in the morning?" RINGO: "We did. We all combed our... well, we don't actually comb it, we shake it." PAUL: "It's the easiest way, you know. You just sort of shake it, it falls forward and you sort of comb it a little bit then, and it normally works out okay." Q: "Ringo, was it a fun experience, or was it actually work?" RINGO: "About eighty percent work, and twenty percent was all laughs." PAUL: "Even the work, which was hard work, was still good fun because, you know, the film was a good laugh, mainly. I mean, even when we were sort of very tired and really knocked out, and we'd do a thing, when we actually saw it on the screen it looked, sort of, quite funny. I mean, there's one scene where I think I'd been out the night before and I was feeling so tired, you know. But I've seen it on the screen since and you can't tell." Q: "I guess only the guys who participated in the movie know the truth." Q: "Ringo, the job of acting-- of saying lines, of reacting to the person who's acting opposite you-- did it come naturally to you?" RINGO: "No, I don't think so. At first-- and I think we all had a terrible time tryin' to learn lines, 'cuz we wouldn't anyway. We used to sort of read them and try and learn 'em before we went on the set." PAUL: "Yeah, I agree, you know. It was very hard to just learn a line and say it, because we've never done that sort of thing before. We've always just thought of something and said it, rather than actually read something on a piece of paper. But I think towards the end of making the film, we got the hang of it a little bit more. At first, it was very frightening, you know. It was nerve-wracking trying to say these things as though we meant them-- 'cuz that takes training as an actor, I reckon. So you know, we had to try and make it look convincing without having any experience." Q: "Well the movie has been done now, and it's a great success. Do you feel now that you want to 'be' actors?" GEORGE: "Not really, no. We still... Even if 'A Hard Day's Night' is the biggest sort of box-office attraction ever, you know, it still won't make us feel as though we're actors. But I think we'd all enjoy making a new film." RINGO "All different things that happened were funny to us, which they haven't printed and put on the film, but it's great when we go and see the film, then we can sort of say, 'Remember that bit-- if they'd have showed the one we did before, you know, where we all broke up." PAUL: "This is another one of these bits-- where we got the giggles as well. Ringo is supposed to be sulking, and John sort of starts joking with him, and starts singing this song as though he's singing it to him, you know. It was quite a laugh making it. Probably doesn't sound very funny now, but anyway, it was." RINGO: "It won't seem very funny on the screen, but to us, we were all breaking up, you know." Q: "George, alot of people would like to know what has been happening with you romantically recently. Can you fill us in?" GEORGE: "Oh, nothing much. Nothing exciting, sorry to say." Q: "You mean you've been freelancing?" Q: "Why do you say, 'sorry to say'?" GEORGE: "Well, you know. People seem to expect you to get married and everything, you see. So, sorry to break their illusions, but I'm not. I'm freelancing, as you say." Q: "How were your trips to Australia and New Zealand." PAUL: "They were fine, you know. The only thing is, it's so far away when you go to Australia, and we tend to get a bit homesick for England, you know." Q: "Paul, what do you think about all these other groups? Are they very imitative with the hair-dos and style of music?" PAUL: "None of us think they're imitations, you know. There may be one or two sort of smaller groups that are. I think they're mainly the ones that never seem to make it, because to make it you've gotta be a little bit different. I think the ones that don't make it-- it's not annoying, it's flattering, you know, to think that they should want to copy us."